Shell says it has completed its first ship-to-ship bunkering of liquified natural gas (LNG) using its LNG bunker vessel Cardissa. The fuel was lifted by Sovcomflot vessel Gagarin Prospect, which in turn is chartered by Shell. 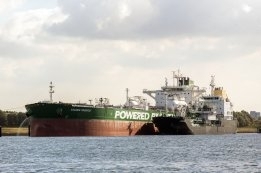 The stem was said to mark a number of other firsts including the fuelling of the world’s first LNG-powered Aframax tanker, and the first ship-to-ship LNG bunkering to take place in the Port of Rotterdam. Allard Castelein, CEO Port of Rotterdam, Grahaeme Henderson, Vice President, Shell Shipping and Maritime, and Sergey Frank, President & CEO of Sovcomflot, all welcomed the move and took the opportunity to reiterate their bullish outlook for the alternative marine fuel. For H1 2018 Rotterdam has see the delivery of 2,026 metric tonnes (mt) of LNG bunkers - a significant uptick on last year buy a total still dwarfed by sales of traditional oil-based bunkers. Following study on public health and shipping emissions.